The provision of care for wildlife casualties remains an important responsibility of veterinary surgeons, limited not only to emergency care but also encompassing the rehabilitation and release of the casualty and the wider impact on the environment. 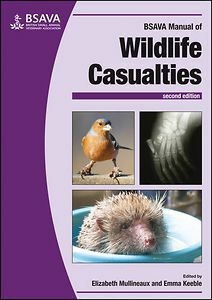 The second edition of the BSAVA Manual of Wildlife Casualties provides critical information for all stages from the initial decision to intervene to monitoring of released casualties. Fully updated, the initial chapters have also been expanded to include new chapters on: capture, handling and transportation; triage and decision-making; first aid and emergency care; wildlife anaesthesia; management in captivity; care and hand-rearing of young animals; and investigation of wildlife crime. The second half of the Manual returns to a species- and group-specific format, covering wild mammals, birds, amphibians and reptiles encountered in the UK. Each chapter gives details on: ecology and biology; anatomy and physiology; capture, handling and transportation; examination and clinical assessment for rehabilitation; first aid and short-term hospitalization; anaesthesia and analgesia; specific conditions; therapeutics; management in captivity; rearing of neonates and juveniles; release; and legal aspects. Specialist organizations and useful contacts are also provided at the end of chapters and in a comprehensive appendix.